I had been meaning to read this book for a while now, but I actually heard about the series because of the second one in line (which I’m hoping to read next). This is book one of the midwife series, and I couldn’t put it down. 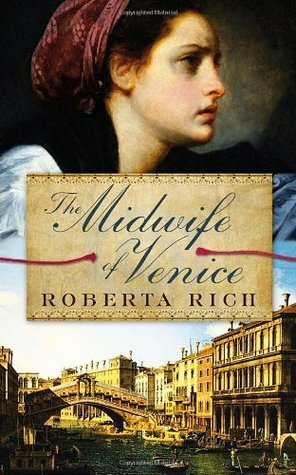 The story follows the life of Hannah Levi, a midwife in sixteenth-century Venice. With that being said, I should note that I know absolutely nothing about Venice, or life in that era, so when people in other reviews complain about the inaccuracy, I don’t have an argument. What I can say is that the writing was well done and the story drew me in right from the start. Hannah is Jewish, and her husband is missing, held captive on Malta as a slave. Her goal is to go and rescue him, and she’ll do anything she can to accomplish this goal. The love that this woman feels for her husband is etched into every word of the book, and I really appreciated that. Isaac, her husband, is working on making his way back to her. I felt his story was lacking in places and was a bit too good to be true. He shares the same passion when it comes to the love of his wife, and I liked how in love these two felt for one another. Hannah is asked to help birth a Christian baby, which is against the law. She also has a special tool she uses to help ease the baby out, which others consider to be tools of evil. She doesn’t care, and continues to use the tools because they help. Life is difficult, the story is dark. Problem after problem seems to follow Hannah around, but she doesn’t give up and she keeps working towards the overall goal of rescuing her husband. This is where I start to have problems with the book. The final 15 percent or so seemed incredibly rushed. Suddenly after an entire book of problems, heartache, and darkness, the clouds just instantly clear and everything magically fits together and works out. It did not seem to fit with the rest of the book and it ruined the ending for me. I’m still going to move forward with the second book to the series because the story was incredibly moving, but I hope the ending doesn’t fizzle out like the first book.